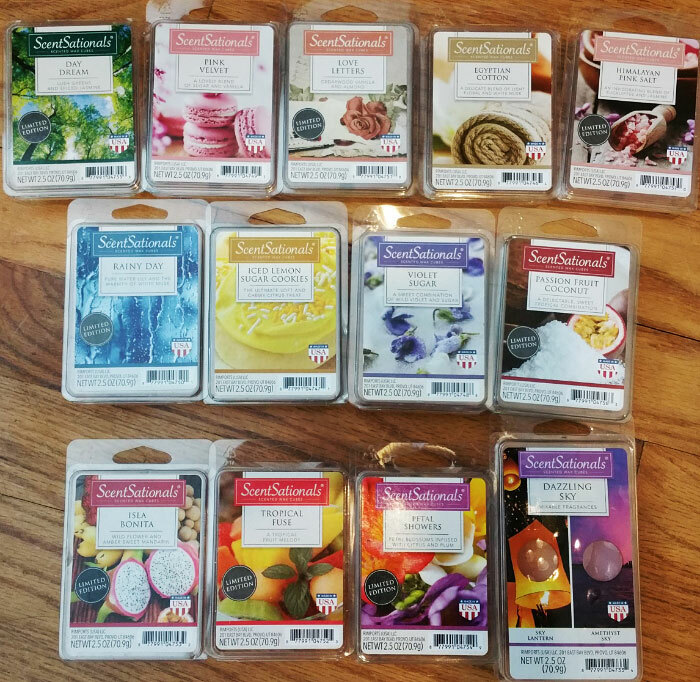 This is a review of ScentSationals Wax Melts from Walmart from Spring 2016. I really enjoy the ScentSationals wax melts from Walmart. Notes: Hints of vibrant greens lay upon an enticing array of amber, jasmine and rose, meshed with citrus lemon notes and soft musk. This is a green plant type floral, not overly sweet like a flowery floral, but more like sweet green grass with a little bit of jasmine wafting in the air. It also has a hint of spicy perfume, just enough to make it "not quite" a floral, but somewhere between a floral and a perfume. Ah, I think that other note I detect is a sweet cedar wood scent, which makes this scent smell a little bit like ScentSationals White Sandalwood scent from a few years ago. Notes: A mixture of opulent sandalwood, oriental amber and pure incense, embracing a sweet dark plum and blackcurrant complex lifted by floral orange blossom, white cedar and milky vanilla bean. A beautiful ambery cedar scent. Notes: The spicy warmth of green cinnamon bark combines with black oud and pure sandalwood, enhanced by sultry amber, oriental vanilla bean, earthy patchouli and opulent musk. A very nice warm ambery scent. Notes: medley of light plump grape, laid upon fresh floral notes of jasmine and white floral. Sandalwood, light musk and warm vanilla give it that warm cozy yet fresh feel. This is basically a toned down version of ScentSationals Vintage Lace (one of my favorite scents). It's a lovely warm cashmere (a lighter sweeter fabric-y amber scent) mixed with old-fashioned white musk. It's not a laundry scent, as there's no harshness and no clean detergent notes, but perhaps a slight fabric softener note. It smells like ScentSationals Vintage Lace mixed with a little bit of ScentSationals Crisp Linens to temper the sweetness. Notes: A fresh, invigorating blend as eucalyptus, lemon, lime and ginger mingle together with lavender, muguet and bergamot. Jasmine, balsam, ozone and vanilla provide the perfect finish. This is kind of sweet masculine scent, not a floral. Any floral sweetness is tempered by the eucalyptus, which adds a clean, soapy, masculine, almost peppery note that makes it smell a little like a sweet shaving cream. But it's not a menthol scent, and there's no Vicks Vaporub or minty note at all. There is a slight "salt scrub" note, so I might classify it as a spa scent, although it's also a fresh, clean scent. I just don't know how I'd classify the scent though. It's not a floral. It's "almost" a cologne scent but not really. And it's also a clean scent, but not completely. Maybe even a spa scent, but a little too sweet. I'll put it under "spa" because it does have a very slight "salt scrub" note. Notes: A blend of deliciously baked lemon and lime, blended with pure sweet coconut milk and sugar, with light notes of vanilla extract. This is a different lemon scent from other ScentSationals lemon scents. It's like a cross between bakery lemon and kitchen lemon. Compared to Living Colors Lemon Bars, Lemon Bars is a little stronger on the lemon, saltier, and slightly more bakery. Compared to ScentSationals Lemon Meringue, the Lemon Meringue is more bakery, and even though it's a fantastic scent, it smells more fake and waxy. Iced Lemon Sugar Cookies is a more authentic lemon "confection", like the filling of a lemon meringue pie, with a tinge of vanilla, and not a lot of crust. It smells like the lemon note in ScentSationals Lemongrass Mint. It's also sweet and has a slight "kitchen lemon" note (like lemon scented dish detergent), so it should satisfy lemon scent lovers no matter what type of lemon you prefer. Notes: A blend of amber sweet mandarin, juicy orange, wild flower honey, macadamia rose and freesia. A sensual base of cedar, sandalwood and musk adds a rich depth. This one is different. It's definitely a tropical fruit scent, but not sweet, more savory and sour, and no coconut notes that are often found in tropical scents. Mandarin smells like orange, but I don't smell any orange or citrus. And if there's a wildflower note, I don't really smell it although it may be way in the background. This one is hard to describe, I guess it's basically a sour fruit, which sounds bad, but it actually doesn't smell bad. I'm not sure if I really like it or not. I think this is one that people will either like or hate. A nice cashmere/amber type scent with a perfumey note and something else kind of milky, can't put my finger on it. Now that I see the scent notes, ALMOND! That's the note I can't figure out, and now I do smell it, as well as a hint of cedar. Notes: A lush passionfruit coconut, fused with cassis and sun-kissed oranges. I smell coconut and a slight fruity note, but also a clean, fresh air note as well as a hint of amber that warms it up and gives it a bit of a foodie quality. It's not a harsh coconut, and it's not a typical tropical scent either. I really like this scent. Notes: A splendid mixture of apple blossom, jasmine and gardenia, infused with light notes of citrus and plum. This is a fruity floral but I can't pick out the individual notes. It smells a little like scented toilet paper, but that's not a bad thing. It's a nice scent, a little generic, and I don't smell citrus or plum. Notes: Sugared lemon, apple and pineapple mingled into a sweet heart of tropical punch and red currant. Sugar cane and vanilla bean in the base deliver a captivating finish. This smells like lemon, raspberry, and almond with a little bit of a bakery note. It's a very nice scent with a bit of a sour note and not overly sweet, almost like a raspberry macaroon with a little bit of lemon, but not quite that fruity either. It's a very nice scent. Looking at the notes, I'm surprised I don't see almond, but it might be the pineapple and currant that I think is almond (I don't smell pineapple per se). Notes: Delicate greens and wild springtime bluebells join notes of sugared rose, pure water lily and blushing hyacinth touched by sparkling April rains, fruit nectars and the warmth of white musk. This smells almost exactly like ScentSationals Bali Shores, but with very slightly different notes. It's sweet and watery with a hint of musky perfume, but it's more of a fresh scent than a perfume scent. It may possibly have another note in it, maybe a smidgen of salty soapy clean air. Comparing it next to Bali Shores, most people might not be able to tell the difference. Notes: A blend of amber sweet mandarin, juicy orange, cassis, wild flower honey and macadamia rose. A sensual base of cedar, sandalwood and musk adds a rich depth. This isn't nearly as tropical as the name and picture suggests. It's a sour tropical fruit scent, but the sourness is tempered by a floral background, although it's not really sweet and the floral is not really noticeable as it's more of a "green", natural type floral rather than perfumey. Melted, it's very similar to Isla Bonita, with that slightly sour fruit note. This smells a lot like ScentSationals Blackberry Cider, but with some different notes, like maybe a barely noticeable smidgen of floral and citrus. If you're not familiar with Blackberry Cider, it doesn't smell like cider at all. It's a very warm almost ambery sweet scent with maybe a hint of blackberry. Violet Sugar is not quite as sweet and ambery, and it may have a smidgen of lemon way in the background because there's a barely detectable hint of sourness. Looking at the notes, it's probably the grapefruit, although I don't actually detect grapefruit or any citrus notes. It's a fantastic scent, and it lasted all day!